If you received or read a disclosure from your broker about options trading stating that trading options is dangerous and you may lose money, do not believe it. If you know what you are doing and what to expect from options, they can be very safe and they actually can be less dangerous than trading stocks themselves. Do you believe me? No? Then read the next text. A friend of mine sent me a risk disclosure given to him by a broker which was describing a few trading strategies and tools investors can use. A portion speaking about selling options was especially interesting. All they were saying about selling options was scary and very discouraging. According to them, selling option contracts causes you taking an enormous risk which can wipe out all your money. Although they agreed that this risk can be partially mitigated by owning the underlying security or having enough cash. Unfortunately such disclaimer is usually very generic and vague. It is aimed to protect the broker and not you, the client. But the primary goal is to scare you so you won’t trade options at all. It is now an industry standard to make a hype around options and mystify them as something a normal investor cannot do at all cost. Per brokers, trading options is something accessible only by rich investors and professionals. The opposite is true. Everybody can trade options and it is in many cases less dangerous than trading stocks. Under certain conditions, options can be dangerous. For example, you have no clue how to trade them and yet you do it. Or if you decide selling naked calls, you really will be undertaking an enormous risk. But all other basic options strategies such as naked put selling, cash secured put selling, and covered calls are actually less risky than trading stocks themselves. Why brokers came up with such disclosures scaring potential investors to death? It is because of their risk they undertake when their clients use naked put selling using margin. Then, put selling is not your financial problem, it is the broker’s problem. They do not want you to trade options because they are scared of you, and your options trading. Therefore, they will never tell you the truth but they will keep you in ignorance and scared to death. I will try to explain this later. Why selling options is not dangerous? When you buy a call option, you speculate that the stock price will grow. What you can lose? You can lose 100% of money you paid for the call contract. In order to make money, the stock price must rapidly rise above the strike price of the call option, otherwise your trade will be a loss. The time value (theta) will destroy your option before it can even make some profit. When you buy puts, you speculate that the underlying stock will go down. Same as with the call option, the stock must move rapidly down in order to make you money. Otherwise theta will destroy your put option. During violent bearish markets this trade makes sense to protect your portfolio and your current positions. Otherwise not for me either. And now we are getting into the “deadly dangerous, risky option selling” (as per the above mentioned broker). There are two trades, two strategies with selling calls. To be honest, naked calls can be very dangerous. How do they work? If you sell a call for a stock, let’s say AT&T (T) at strike price of 34 a share and you do not own the stock, you are undertaking an enormous risk. If something great happens with the company, for example over the weekend they announce a very good news, then the following Monday, the stock may open higher with a gap (for example the stock jumps up from $33 a share to $150 a share over the weekend). you will have no time and no option to fix this trade. Then you are in trouble. You will be forced to sell 100 shares of the stock (which you do not own) and you would have to go and buy it for $150 a share in order to satisfy the call obligation. The loss can be huge. But who would trade such a trade? If you have no knowledge about options you may open such trade as a mistake. Or you need to be a very skilled trader in order to manage such a trade and avoid problems (usually traders cover such trade with a different option creating all sorts of option spreads, so they do not stay fully naked. This was the only dangerous option trading I know of. And now lets see the “piece of cake” part. I like the total return or buy-write strategy. How that works? You buy 100 shares of a stock, for example AT&T (T) at 34 a share, and at the same time you sell a call at 36 strike and collect, for example, 1.50 (or $150) premium. Your call contract is covered by 100 shares of the stock from the beginning. What can happen to you? Two things. If the stock stays below 36 strike, the option expires worthless and you can sell another contract. If the stock rises above 36 a share, your 100 shares of the stock will be called away from you. You will have to sell 100 shares of (T) at 36 (strike) a share. You realize a gain by selling the stock ($3,600 – $3,400 = $200 gain) plus collected premium ($200 stock gain + $150 premium = $350 total return). As you can see, with selling calls you actually make more money, than trading stock itself. So where is the risk? The risk is in a situation when the stock drops too low. In that case the loss on the stock side is so large that premiums collected cannot compensate for the loss. But if you happen to own a dividend growth stock how often these stocks drop so low that you stop sleeping well at night? And compare it to a single stock trading. What is the difference between a stock you bought at 34 a share and it dropped over the weekend to 10 a share because of bad news? The risk is absolutely the same as when owning a short call contract. You are losing money in both cases, but with options you are losing less. The total return covered call strategy is a bullish strategy and works well against stocks you want to buy and sell with gain. What about the partial return strategy? This strategy can be either bullish or bearish. If you are bullish, it works the same way as the total return strategy where you write call contracts against the stock you already own (so no stock buy portion) and you want to sell the stock. If you are neutral or moderately bearish, this strategy can help you collecting premiums (sometimes called another dividend) while you are waiting for the stock to grow and make you capital gain. This works well in sideways markets. The third expectation is If are very bearish and expect the stock to drop significantly. This strategy is a protective strategy and again you write the contracts against stocks you already own. 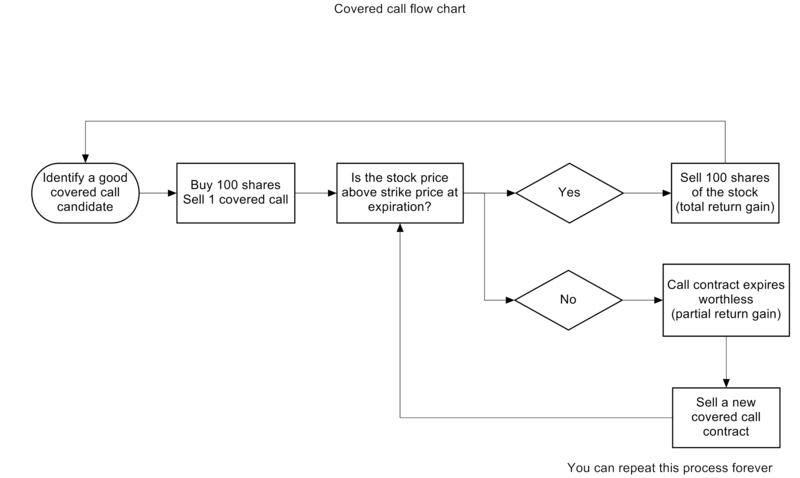 If you expect the stock to fall down in bearish environment, you may decide to sell a deep in the money covered call. As the stock falls down, the value of the contract is diminishing and eliminating the loss on the stock. For example, you have a stock (T) which currently trades at $34 a share. The markets are turbulent and you expect the stock to fall to $25 a share where you identified next major support. You sell a long term deep in the money call, for example June, or even January 2015 25 strike call. For such contract you will receive 9.6 or $960 premium. If the stock falls back down to 25 a share, the call option will become worthless and you either buy it back or let expire. You keep the full premium $960, but your stock will show $900 loss. The entire trade protected you and you are about 60 dollars in positive territory. Where is the risk? The risk is in early assignment. If your expectations were wrong and the stock continues rising, the opposite trader who owns your call may exercise the option early and you may lose money. But that would happen if you originally bought the stock too high or high enough that the collected your premium won’t be able to cover the loss. Otherwise this trade will work the exact same way as total return trade. If someone is new to investing, I always discourage options. Learn how they work and ease into it. I think your post can serve as a good tutorial every beginner should read! The problem is that many are discouraged even to learn options and find for themselves that it is not dangerous at all. Of course, if a novice investor has no clue, yes I agree, you shouldn’t trade it but learn first. Thanks for a comment.